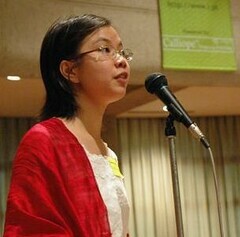 Sacha Chua, Filipina, is the "girl with an instruction manual," according to her boyfriend, Dominique Cimafranca, who wrote about how he got to know her in "Cupid is a geek" (Philippine Daily Inquirer, 4 May 2005). She just came back from Japan on a scholarship and recently got accepted for another one in Canada. If you want to check out her "instruction manual," see "A tongue-in-cheek guide to going after or making friends with Sacha Chua." This is the third in a series of posts. Please see "The Filipina in Cyberspace" and "Images of the Filipina Online" to understand the objective of this series. If you would like to contribute to the effort to project a more wholesome image of the Filipina online, please put a photo of a Filipina (whom you think best represents the Filipina today) on your website or blog, make sure the word "Filipina" appears in the caption or as close as possible to the photo, and that the same word is also in the photo's file names (e.g., filipina.jpg) or URL (e.g., www.filipina.com). Part of the problem we have now, in my opinion, is that it is mostly those engaged in the trafficking of Filipinas who put the word "Filipina" on their websites. And so, henceforth, females of Filipino descent will be identified in this blog as "Filipina" (and not just the generic "Filipino"). Flickr is still relatively new, but if you look for photos tagged Filipina, you will see that the same problem is also prevalent. What can we do? If you're a Flickr user, make sure you use "Filipina" as a tag, when appropriate, for your photos.